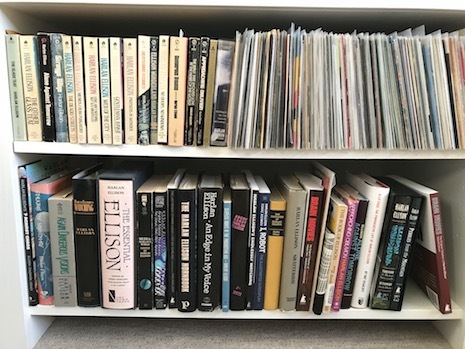 A portion of my Harlan Ellison library… and my 45s. Known primarily as the guy who wrote the best episode of Star Trek (“City on the Edge of Forever”) and for penning the material that became the 1976 Don Johnson bomb A Boy and His Dog, I’d read Ellison’s short stories for years before picking up his collection of essays and criticism called Sleepless Nights in the Procrustean Bed in 1984. That was followed a year later by An Edge in My Voice (in fact, this column’s title is a play on that book’s title). It is impossible to read Ellison’s essays and not absorb his rhythm, syntax and style. His is a voice of measured anger bordered by reason, sarcasm, intelligence and wit. I spent a good chunk of my college years emulating Ellison’s writing style before figuring out one of my own. A day does not go by where I don’t think about Ellison and his writing. Tonight’s the annual Memorial Park concert/fireworks display featuring Mickey Thomas’ Starship and Boston/Styx cover band Bostyx. I can’t imagine a worse combination, but the folks going to the concert aren’t there for the music, they’re there for the fireworks. I assume organizers are aware no one cares about the music and thus book the most benign acts for this show. If they’re going to get 50,000 people in the park regardless of the entertainment, they should consider other options, but I’m sure I’m not the first person to suggest that. Tonight Hussies headline at The Brothers Lounge. KC band Red Kate also is on the bill along with Tiananmen Squares. $5, 9 p.m.
Sean Pratt and the Sweats return to fabulous O’Leaver’s Saturday night. They’re bringing with them Brooklyn’s Becca Ryskalczyk (of Bethlehem Steel). Dave Nance opens the evening at 10 p.m. $5. Dirt House celebrates the release of its debut EP Come Over at Slowdown Jr. Saturday night. Opening is Kait Berreckman and The Jim Schroeder Quintet (Schroeder plays guitar with Dave Nance, among others). $8 adv/$10 DOS, 9 p.m.
Also Saturday night, Centerpiece, a band I just heard about yesterday, is celebrating the release if its debut EP Simple at Reverb Lounge Saturday night. North by North and I Forgot to Love My Father open. $7 adv/$10 DOS. 9 p.m.
Sunday night there’s a 5-band indie-punk show at Reverb headlined by Big Bite. Also on the bill is Supercrush, BiB, Death Cow and Ginger Ale. $8, 9 p.m. Finally, The Waiting Room is hosting its annual Canada Day showcase — 10 bands playing Canadian covers including Mike Saklar, Korey Anderson and The Electroliners. This is a benefit for the Siena / Francis House with food available and everything. $8, 8 p.m. More info here.